We usually present just one tense to students. However, ever since I was a student I have always wanted to see a more complex picture and get more tenses at the same time. And as we have just finished the whole textbook with one of my elementary students an opportunity presented itself to sum up all the five tenses covered in the textbook. As a result, I created a special timeline which in combination with my explanation helped my student clarify the usage of all the tenses. I hope it will work for you too. Have a look at the timeline below and read the explanation carefully. 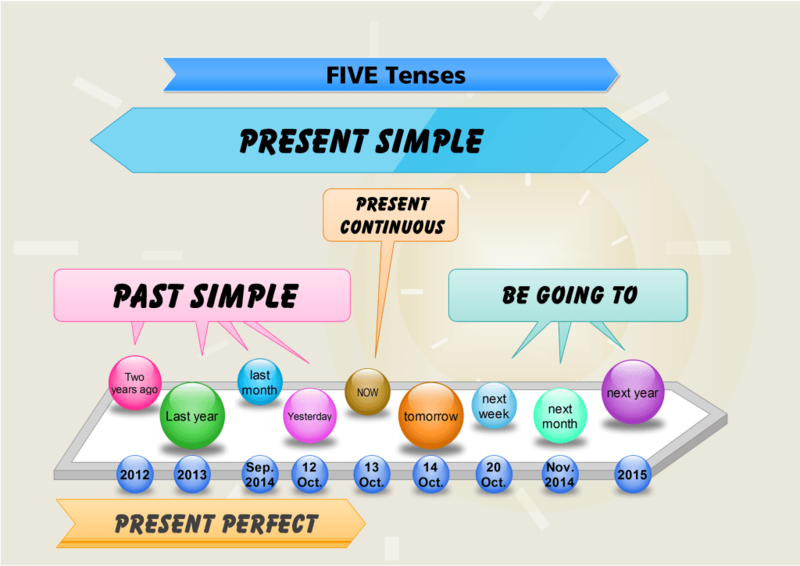 At the top of the mind map there is the blue Present simple tense. It is high above the timeline as the tense is used for things that are time neutral. We use this tense for facts and actions that get repeated regularly. The pink shape belongs to past simple tense. There are three arrows pointing to different points in the past as the tense is used when we speak about finished events in the past. The light blue is reserved for BE going to which is used for plans in the future (for elementary students I do not mind saying that it is the future tense 🙂 ). The orange colour is for present continuous and the arrow points at NOW as the tense is used for speaking about the events happening at the moment of speaking (again, it is very simplified but for elementary students fine). The yellow colour shows the usage of present perfect. It is used for past actions which are somehow connected with the present moment. Most frequently we use it to speak about experience (you say what you have experienced up to now). You can find a nice explanation of present simple and continuous on BBC pages. The following quiz is in HTML5. It contains 30 items and you can attempt it anywhere on your mobile phone or desktop. Your task is to put the verbs in the brackets into the correct tense (choose one of the tenses presented here). If you get over 70% of the answers correct, you can play the game Math pop. Enjoy! don’t even spend your time doing this test. it’s full of errors. the creator of the test hasn’t included all the possible correct answers. i can,t recognize between present and past simple even the continouse in guestion. I would love to publish a post on this topic soon. Really. I am the creator and I think I have included all the possible answers within the limits given by the instructions. Can you be more specific?